Dallas returns to TV: Larry Hagman and the Ewings, reviewed. Dallas returns, and Larry Hagman reclaims his throne as TV’s most hateable, lovable villain. 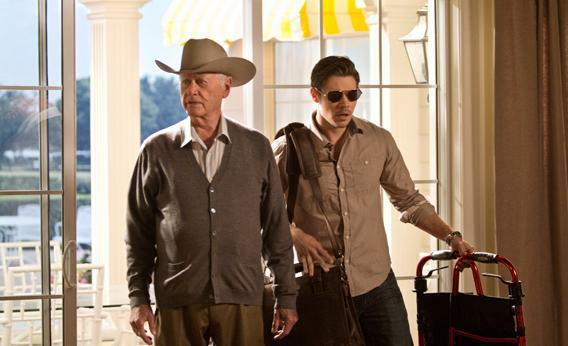 J.R. Ewing (Larry Hagman) and son John Ross Ewing (Josh Henderson) in Dallas on TNT. Once upon a time in the West, Dallas (CBS, 1978-1991) was not just a ratings hit, not just a zeitgeist gust of fantasy, but an epic mass-culture potboiler—a soap opera raised to the status of an institution. It’s fun to think of it as of a panoramic velvet painting: The Western landscape of Bonanza and Giant and wildcatting George H.W. Bush, with shades of the Kennedy-kitsch school of American pulp, first painted for the media era of Dallas Cowboys Cheerleaders, a 1979 Jane Seymour made-for-TV movie watched by 48 percent of the TV audience. Think of Dallas as a lurid Camelot on the range. Strutting with a 1970s pomp, Dallas elaborated an expansive melodrama about white-hatted right and snidely wrong, blood ties and oil wells. Like Aaron Spelling’s Dynasty, it loved the ‘80s—the new aesthetics of power and lust—and the decade loved it back. Then the moment passed, and primetime soap operas began exploring other settings (law firms, hospitals, the Peach Pit, the Bachelor’s tract mansion…). In 1991, Dallas went out with a bang—the second shooting of J.R. Ewing (Larry Hagman). Thus, perhaps, if you aren’t paying full attention to the scenes of J.R.’s skeevy son (John Ross Ewing, played by Josh Henderson) frolicking with his lover in the petroleum fountain of an oil strike; of Bobby’s secret cancer diagnosis (“My son is getting married in a couple days. I don’t want this on his shoulders.”); and of a whole bizarro-world CW show inside the show: Jordana Brewster plays Elena Ramos, the cook’s daughter who might still love Bobby’s adopted son (Christopher Ewing, played by Jesse Metcalfe) but is now with J.R., who wants her to spy on Christopher’s alternative-energy startup, which accidentally triggered an earthquake in China, and also to step in as a bridesmaid at Christopher’s wedding to Rebecca Sutter (Julie Gonzalo) … If you lose the thread of the family land battle in the tangle of that, then there’s a helpful bit of exposition when John Ross has his first scene with J.R.
J.R.—a satanic sweep to the long gray hairs of his eyebrows—is resting, seemingly insensate, in a handsome room at a palatial long-term-care facility. Apparently in all those years since the shooting, weaselly little John Ross has never been to visit. But now the stakes are so high that John Ross pulls up a chair and whines, “Bobby’s selling Southfork to a conversancy, Dad,” and then goes on about how he discovered 2 billion barrels of crude beneath the ancestral ranch, filed an injunction to overturn the terms of his grandmother’s will, yadda yadda yadda, going over stuff we’ve already heard twice. Dallas may not always compel your attention, but it does a good job of telling you what you missed. J.R., heretofore all but comatose, flickers to life: “Bobby was always a fool ….” He’s looking tanned, rested, and ready for spiteful action. He refers to his adopted nephew as a “foundling,” as if this were a penny dreadful, which it kind of is. He has the boy call down for red Jell-O, and there is a satisfying rattle in his voice when he tells his son how they shall defeat their wayward kin: “Courts are for amateurs. Nooo, this is personal.” The actor knows that the audience wants to see him chew the scenery and savor the chewing, and he obliges—and emotes as if the scenery is juicy with barbecue sauce. Larry Hagman is having fun as usual. J.R. remains a towering bad guy, three decades after his shooting constituted a ratings triumph topped only by the M*A*S*H finale. He was the man you loved to hate; Clive James wrote, of the Who Shot J.R.? cliffhanger at the end of Season 3: “You were left certain of one thing: that you could not be sure it was Sue Ellen who shoots J.R. Candidates for the honor were queuing up in the corridor.” Why do we love J.R. Ewing? For many of us, it’s simple: We love J.R. because he taught us how to love hating.